A large, pure white body sponge, perfect for people troubled by atopy or sensitive skin. Its weak alkalinity washes away grime and dirt even without the use of soap. A jet-black body sponge, perfect for people troubled by atopy or sensitive skin. The absorptive action of the charcoal powder draws dirt and excess sebum out of pores, keeping skin clean. 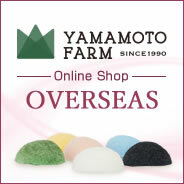 Far gentler and more durable than previous konjac sponges! Its slim, "sheet" shape makes the sponge easier to use around the nostrils and on other small areas. Its slim, "sheet" shape makes the sponge easier to use around the nostrils and on other small areas. The absorptive action of the charcoal powder draws dirt and excess sebum out of pores, keeping skin clean.